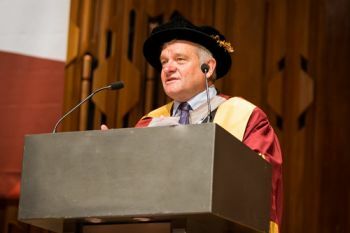 Sir Paul Nurse, one of the world's leading geneticists and cell biologists, has been awarded an honorary doctorate during City University London's summer graduation ceremonies. Sir Paul is President of the Royal Society and the Director and Chief Executive of London's Francis Crick Institute. In 2001, he was awarded the Nobel Prize in Physiology or Medicine for his research into the control of the eukaryotic cell cycle and how cell shape and cell dimensions are determined. His major work has been on the cyclin dependent protein kinases and how they regulate cell reproduction. Born in Norwich in 1949 and married with two daughters, Sir Paul received his undergraduate degree in 1970 from the University of Birmingham and his PhD in 1973 from the School of Biological Sciences at the University of East Anglia. From 1973 to 1979, he pursued post-doctoral studies in the Murdoch Mitchison laboratory at the University of Edinburgh. In 1976, Sir Paul identified the gene cdc2 in yeast which controls the progression of the cell cycle. In 1984, he joined what was then known as the Imperial Cancer Research Fund (ICRF) leaving four years later to chair the microbiology department at the University of Oxford. He then returned to the ICRF in 1993, as Director of Research and in 1996, became the Director of the ICRF, which was renamed Cancer Research UK in 2002. Sir Paul fervently believes that scientists should have a more visible presence in society - a role that is not restricted to a purely scientific environment: "I do not want scientists to stay in their labs all the time, I want them to mix with the best minds from industry, the city, the public services, the media, to spark off new ideas to help science benefit us all."